I hope to start a dialog on a topic I think is very important. The topic is “Stupid”. I hope you will watch the video and comment with your thoughts, arguments or analysis. I think the cost of “Stupid” on our institutions and organizations is becoming overwhelming, and we must figure out a way to deal with it. Before we can effectively deal with it, we have to understand what it is. In the video above, and description below, I try to create a “Taxonomy of Stupid”. Notice that in this work, “Stupid” has nothing to do with education level, or how quickly someone learns. It has to do with whether their actions benefit themselves, and benefit others. The intriguing thing about “Stupid” people is that there actions do not benefit other people, and do not benefit themselves. It is easy for us to understand “Bandits”. They are selfish, and always doing things only to benefit themselves. This is easy to understand and easy to deal with. Also, givers are easy to understand and easy to deal with. They are selfless people that just want to do good, without wanting anything for themselves. We admire, and aspire to be “Smart” . . . someone who makes the world a better place, and is nicely rewared for their work. 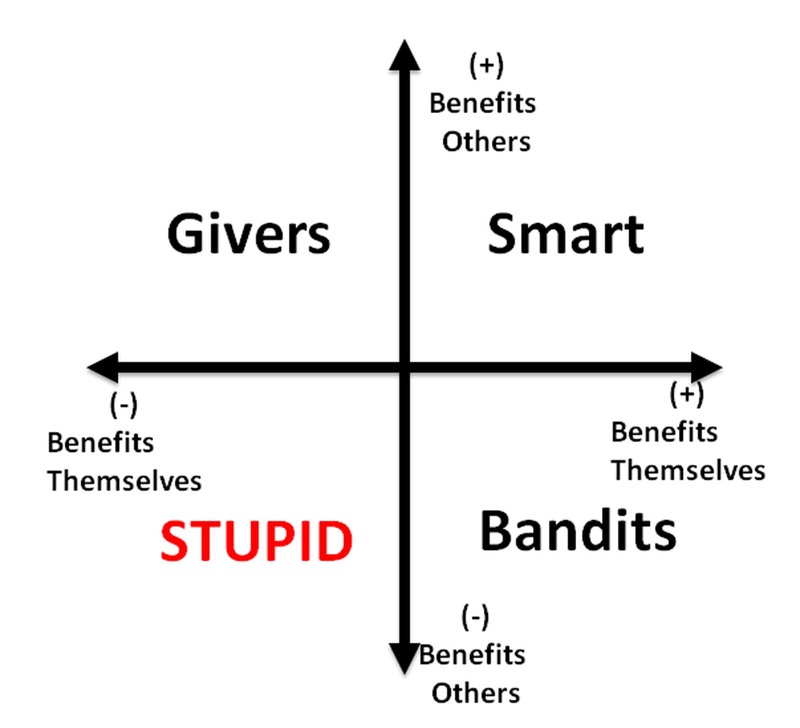 I would suggest that people in the “Stupid” category cause immeasurable damage to organizations and as a society, we have to figure out how to better deal with them. In order to do this, I suggest we consider what I call the Seven Degrees of Stupid. Stupid is a person whose actions are counterproductive to themselves and to others. They do things for no apparent reason and those things are damaging to other people, while bringing no benefit to the person themselves. The Stupid person does not do stupid things deliberately or maliciously. He is not deliberately trying to create disorder, but the essence of his being is to generate disorder all around him. He often appears to do things independently without talking to other people, and does things for no apparent reason. He is not even trying to generate a beneficial outcome, and when confronted often has difficulty explaining why he did a certain thing. The Stupid Person always breaks things. Understand that “things” can be physical objects, organizations, systems, software, processes or relationships. The core competency of the Stupid Person is to bring disorder to all things around him. A smart person constantly brings order to the things around him, but the Stupid Person brings disorder. The stupid person is not trying to bring disorder, but it is just the fundamental output of all his actions. The stupid person will always Maximize Disorder. It is not enough to just create disorder, he will always Maximize Disorder. That means that he will always break something at the worst possible place at the worst possible time. This characteristic is what allows him to always Maximize the Disorder around him. Again, there is no particular reason the Stupid Person did the damaging thing they did. They do them without talking to people first, and for no apparent reason. In words, this is saying that the negative impact of one Stupid Person greatly outweighs the positive impact of 10 Geniuses. The disorder brought by one Stupid Person in an organization can easily eliminate the positive impact of many very smart people. A Stupid Person has an uncanny knack of convincing other people that their way of doing things is right. The smart person knows that the Stupid Person is suggesting something that is wrong and will bring disorder, but some peculiar aspect of the Stupid Person’s nature is that he can convince people that his ideas should become the Standard Operating Procedure for the organization. The smart person will warn that the Stupid Person’s idea will bring utter disorder to the organization, yet the Stupid Person’s way is always adopted. Then when utter disaster occurs, the smart person is blamed, since his negativity, unwillingness to support the new direction, and argumentativeness must have been the reason for the disorder. Not only will a Stupid Person never have a good idea, but the Stupid Person is not able to recognize a good idea when it is put in front of him. He has an ability to ignore facts, data and logic to continue to believe that his way is right, despite the disorder it is bringing to the organization. It is almost impossible to force a Stupid Person to do things the right way. On some occasions, he might be forced to do things the right way, but he will always go back to doing things the Stupid Way at the worst possible place and the worst possible time. Again, this ensures that he continues to maximize disorder in the organization around him. The Geographical Extent of the actions of a Stupid Person will always be much greater than the Geographical Extent of the actions of a Smart Person. A smart person will come to work and face a set of tasks he must do. He realizes that by grouping the tasks in a certain order, he will not have to retool as often, and hence can complete his work most efficiently (High Degree of Order). His Smart Actions have limited geographical impact. The impact is usually limited to his immediate cubicle, or potentially to people in adjacent cubicle. In contrast, the geographical extent of the actions and ideas of the Stupid Person will permeate the entire operation. One reason is that the Stupid Person is very often drawn to jobs involving writing Standard Operating Procedures, or to Bureaucratic jobs which define company policies and procedures. This is a natural consequence of the Third Degree, which is that a Stupid Person will always maximize disorder. The Stupid Person is drawn to jobs which will enable him to Maximize Disorder. In many cases, organizations are unwitting co-conspirators with the Stupid Person. If the stupid person is on the factory floor, he constantly breaks equipment, gets hurt, and causes accidents. The factory floor manager becomes frustrated, and shuffles him off to a bureaucratic position, where he eventually writes company policy. Hence the smart person loses his ability to even have limited Geographic Impact, since he now must follow procedures written by the Stupid Person. Hence Disorder continues to be maximized in the organization. I would appreciate your comments on this below.